Yesterday I dropped by Forever 21 and spied this top. You already know I copped it. It is RARE that I see light-skinned, natural-haired women depicted on tees. It’s usually brown-skinned women with huge lips rocking massive fros. No offense to anyone out here, but that image is very limited in scope because naturals come in all shapes, sizes and colors. I genuinely appreciated seeing a little diversity. 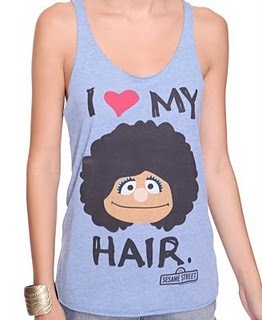 But then today, I came across this Sesame Street character that the t-shirt is based on. She is a brown-skinned little girl who is renowned for singing “I Love My Hair,” which teaches little Black girls who watch the show to embrace what is naturally theirs. Clearly Forever 21 lightened the character’s skin before attempting to sell this shirt. Now I’m torn. Was that cool to do? I’m assuming it was done to make the shirt more appealing to more people and not make it such a “Black” thing, but it takes away from the integrity of the intent of the Sesame Street character. On the other hand, by lightening the skintone I feel like the shirt is able to represent more curlies than the stereotype that I described earlier in this post. I was all for the shirt, that is, until I just saw what the real character looks like. As a Black woman, It saddened me when I saw it and I wonder what message that sends to the little brown skin girl who will see this shirt. Does it say to her, “I love my hair but my skin should be lighter”. To the little girl whose skin matches the shirt, it says something completely different. I have such a problem with lightening/darkening of skin in advertisements because it sends the wrong message. You raise some EXTREMELY valid points here Angie! I’ve heard a lot of feedback where many Black women interpret the tee as being a White girl with big hair. It seems that mainly light-complexioned women assumed the figure was Black. So for many, they have an issue off of what they see as an attempt to change the race of the figure. Either way, it’s all wrong. The figure is intended to be a brown-skinned Black girl. I did notice that alot of the pictures did have dark skinned women with really big lips!!!! They were not my favorites however. Thanks for these sites! I like these shirts better than the ones I’ve already seen online. Honestly, I don’t see the big deal about the skin color change– Ashley said it herself, she appreciated that the shirt offered something different than the ‘normal’ dark-skinned, big-lipped, huge fro woman– and that’s what attracted her to the shirt as well. Whatever the case may be when it comes to fro/natural hair accentuating accessories/apparel, I think its phenomenal that its being marketed in main-stream and uber popular retail establishments such as Forever-21. I knew a time when it wasn’t. Black women have always been portrayed in their dark skin paired with the fro (in the most general sense). Of course, this was to differentiate them from their white counterparts in an obvious manner. If a light-skinned black woman was being marketed, you knew it because she was a few shades darker than her white counterparts, but she always rocked the straight hair. Even then, you could have confused her with being a Latina or some ‘exotic’ mixture of races. Anyways, it was always a progression: the darker the skin, the curlier the hair, and the lighter the skin, the straighter the hair. We all know how its been. This goes hand in hand with Angela’s comment. Society has had to “get used” to the big curly fros and natural hair. They haven’t been a standard of beauty– they’ve been looked at as messy and unkempt symbols of rebellion in many cases. A negative connotation has paired itself with the darker skin color as well. And this is a sad and unforgiving fact. I think its positive that the mainstream is recognizing that Black Beauty can go both ways– and promoting it! That’s where it starts, unfortunately– it makes a certain ‘look’ popular, and thus more acceptable. Now, as far as the t-shirt makers changing the color of the Sesame Street character’s complexion, it doesn’t look too different, in my opinion. Myself, knowing a little about marketing, I know its not uncommon to vary the color shades of the subject in order to achieve the best “look” for a piece. There could have been a very standard reason to change it up in this case. Who knows. BUT, I’m not making any excuses. I love the tee. I think I’ll even buy it! I have no real opinion on this matter as I can’t speak too intelligently being I’m not a black woman. But if I had to give one my initial thought is that I don’t see a huge deal with the t-shirt. I’m sure there are Elmo or Cookie Monster tee’s that are a darker or lighter shad of red and blue, respectively. Like Veronika eluded to, I believe the marketing department probably used a standard reason to change it. And on 2nd thought, is this an actual tee-shirt made by Seasame Street anyway? Or some knock off from another company. If the latter then changing the shade of the skin may have something to do with copyright infringment and making sure the “likeness” of the original character wasn’t exactly the same to avoid any legal issues. Oh well…carry on. you see that little logo on the bottom right-hand corner of the shirt? it’s the sesame street logo lol.